“I box at least 3-4 times a week. Pag may free time talaga ako, every day. Ready to compete in the amateurs ako. Hindi lang puwede because of work. [But] pinipilit ko nga ang manager ko that I want to fight. 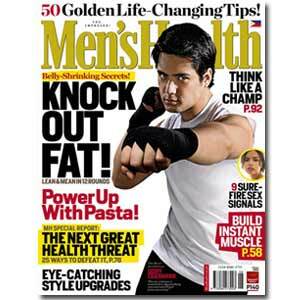 I really want to fight," reveals Geoff Eigenmann in his interview with Men's Health. Geoff credits his weight loss to his love for Ultimate Frisbee, which he played for two years. Today, he shares with Men’s Health another sport he is passionate about: boxing. Lest you write Geoff off as basagulero or someone who is just out to throw some punches, he is quick to dispel that notion. It is not easy to stay as dedicated as he is to keeping fit, but Geoff shares a very effective motivator: try looking at your old photos to remind you of how far you’ve come. Inspired to get fit like Geoff? Get started by joining the Men’s Health All-Terrain Race on June 21, Sunday at Sta. Elena, Sta. Rosa, Laguna. Open to men and women of all ages, the Men’s Health All-Terrain Race consists of a trail race and bike race set on a course that has never before been opened to the public. For details on how to join, visit www.menshealth.com.ph or grab your copy of the June issue of Men’s Health, available in newsstands, bookstores, and supermarkets nationwide.